Lately I have been reading a lot about European (mainly Russian) graphic design history. 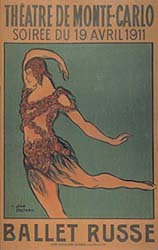 And in doing so stumbled upon posters for the Ballet Russes, and thought to myself “isn’t that documentary in my Netflix queue?” And indeed it was. I really appreciate the fact that some amazing people decided to film the Ballet Russes performances. The concept of dance being a momentary and dynamic experience is a concept that has always left me feeling conflicted. Dance along with theater and other performance arts pieces (such as the Happenings of the 1950s & 60s or Fluxus art), can be performed forever (in theory), like Nutcracker ballet for example. But each performance and each combination of dancers and audience experiences are unique and differ. These performances are so valuable and precious because they, most of the time, are not filmed or really documented in a manner that makes them permanent, like a painting or a photo. They are not captured in a way that can be enjoyed by the masses forever, and in some aspects it is sad, but I think that in other ways, this is what makes the performances so magical. It’s amazing that the filmmakers found all of this priceless footage, all of these amazingly talented 70-90 year olds and made this documentary. Although not a dance history buff, I am a fan of dance, and an ex-ballerina, err kind of. My most critically acclaimed** performance was dancing to the song “Hi-ho!” from Snow White and the Seven Dwarfs when I was 12; my farewell piece, as I then retired from my 3-year dance career a few months later due to the inability to do the splits. :oP Enough about me, this film was well edited, well researched and full of richly descriptive and delightful stories about traveling the world to bring ballet to the people. I highly recommend it, if you haven’t seen it already. So, like Center Stage or Dirty Dancing, this film made me want to dance. Like, as soon as possible. It also made me feel really out of shape compared to those 80-year-olds in leotards with those ever impressive plies and releves. In essence it made me think about the company that my friend dances with, and their upcoming open house, which I will probably check out… or actually maybe I’ll just go and watch. :o) I’m kinda rusty. The RKDC has performed in numerous venues and universities throughout the United States since opening its doors in 1993. Klenjoski’s pieces often explore her fascination with the human experience in a contemporary society. Utilizing partnering to convey diverse relationships in her pieces, Klenjoski’s clever voice brings a unique element to the world of contemporary dance. This open house will create an opportunity for anyone in the community who has a love for dance to sample her classes and get a feel for her take on contemporary movement and choreography. ** not actually critically acclaimed… unless my parents count as critics, in which case, the performance was acclaimed. Hi! I just found your blog via the wordpress tagsurfer. I have a blog about dancing as an “adult learner”. If you have a studio in your area that caters to adults, why not go back and reprise that snow white role or try some new form of dance? Isn’t it incredible how seeing other great dancers makes us want to dance? I haven’t seen Ballet Russes and will have to check it out. I get a lot of inspiration from the old hollywood musicals with Gene Kelly, Fred Astaire, Cyd Charisse, etc. So You Think You Can Dance is also a great show to watch for inspiration. Thank you for the nice comment. But no, i wasn’t good enough for a solo part. I was in the ensemble for the “Hi-ho!” dance. :oP But I do take Cardio Dance at the UCI Recreation Center. I would love to dance again though, but we’ll see. And yes, I too love me some old dancers. I think my favorite kind of dance is tap, so I always love watching Shirley Temple. Geeky, I know. But yeah, check out the movie! Cheers!